With optimum freshness to capture those great aromas! These varieties are usually low in alpha acids but high in essential oils. Brewers wishing to create high class, heavily hopped beers should use aroma hops for all three purposes. 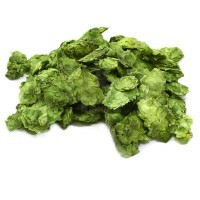 The bitterness imparted by aroma hops such as Goldings or Tettnang is totally different from that derived from high alpha varieties such as Northern Brewer or Target. We keep our stocks just sufficient to facilitate the arrival of fresh stocks weekly.